On tour from New York! Click HERE for Spoke’s website; while you’re there, make sure to check out their great ensemble playing on the tune “Benefit”. Breaking the jazz mold with a spontaneous and playful approach, Spoke is a group of young New York artists whose reputation has made them a darling of the club and festival circuit. Their arrangements have a truly ensemble feel with musical interplay and variety that defy the most creative musical imaginations. Their motto says it all—“reinventing instrumental unity”, drawing on the best of both arranged and improvised music. 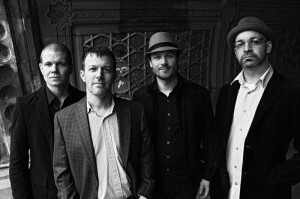 Converging in NYC from disparate corners of the planet, the band features: Andy Hunter (trombone), Dan Loomis (bass), Justin Wood (sax and flute), and Danny Fischer (drums). No stranger to the finer clubs in NYC (Birdland, Blue Note), this group of players brings the best of the Big Apple to Waterloo. Each with a distinctive and appealing sound, these players also weave together one of the most compelling group sounds in today’s jazz scene. Prepare to be mesmerized by a virtuosic and emotional display of contemporary jazz for the ages. Visit our calendar for details on tickets, show time, and our opening schedule.